Kim Warp has drawn a prop comedian (he has an arrow through his head) performing a stand-up routine for that toughest of audiences: God. God is all-powerful, and the comedian in the drawing looks like the kind of guy who would make Viagra jokes, so my final caption idea was, “You’re omnipotent? Take a pill”—a joke that should really be followed by a rimshot. Now let’s see what you came up with. As someone who’s often criticized (especially at work) for making inappropriate jokes—I’m a poverty lawyer and some of my colleagues are extremely earnest—I appreciate that fourth entry. All are good, but the third and shortest entry is best. Here’s another version of the same joke that’s clever but far too long: “Oh, Steve Martin uses a fake arrow. 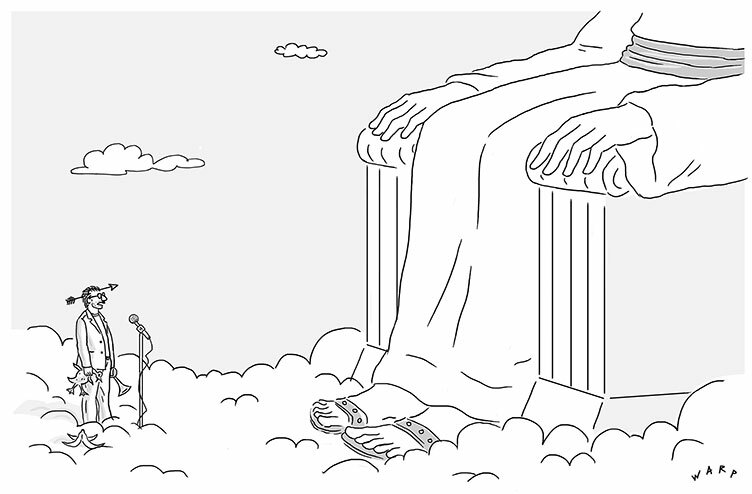 Wish I had known that three minutes ago.” Steve Martin, it turns out, is now a caption writer who recently started collaborating with New Yorker cartoonist Harry Bliss: https://tribunecontentagency.com/steve-martin-harry-bliss/. I also collaborated with Bliss, and while I’m a little annoyed with Martin for taking my job—isn’t he busy enough with his stand-up comedy, talk-show and SNL appearances, acting, writing, and music?—I have to admit that their collaborations are really good. The second entry is better because it’s shorter and ends with the word “bar,” which serves as the punchline in both jokes. My absolute favorite, however, was the personally meaningful, “I’m here because some people can’t take a joke.” In the end, of course, I don’t get to select the winning caption or the two runners-up. That role is reserved for the God of captioning, Bob Mankoff (or B-b, which is how the most reverent write his name to avoid the risk of the sin of erasing or defacing it). As always, He will anoint the week’s champion.